Conventional hot water systems add considerably to monthly energy bills because of standby heat loss. These standby losses multiply for multifamily properties with several storage tanks and expansive distribution systems, resulting in inflated energy bills for owners and residents. Additionally, many properties offer their residents storage options in basements that are typically shared with water tanks. Property owners face the risk of water tank leaks that can damage valuable property in storage. The size and number of water tanks in these areas reduces the space owners can offer to residents for storage or other amenities. Energy Trust offers a variety of incentives for tankless water heaters at multifamily properties to encourage property owners to make the switch. Overall, the value added for owners makes their apartments more attractive to renters by lowering energy costs, reducing footprint of storage tanks and minimizing risk of property damage in the case of leaks. Gas Commercial Condensing Tankless Water Heater $2.75 per kBtu/h Minimum 94% thermal efficiency, electronic ignition, input of 200 kBtuh or greater. Gas Condensing Tankless Water Heater $300 each Installation of condensing tankless water heater with EF greater than or equal to 0.94. Input less than 200 kBtu/h. Must supply hot water to multiple units. *Additional storage tank capacity cannot be added. Gas condensing tankless water heaters less than 200kBTU/h installed in tandem to meet higher demands are eligible for the $300 incentive per water heater. Use Form 320P to apply. 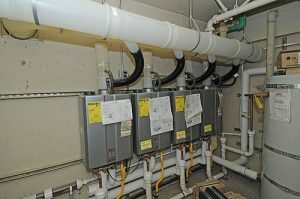 Questions about tankless water heater incentives available for existing multifamily properties? Contact Nate Collins, trade ally coordinator, at 503.278.3075.